16253. Heather Marie FLORY (Ronald Lloyd FLORY , Thelma Jean DIEFFENDERFER , Elizabeth M ZETTLEMOYER , Mary Catherine BITLER , James Lewis , James , John , Johannes ). Heather married Raymond E STRAWSER. Heather was also in a non-marital relationship with Todd HASSLER. 20222 M i Nicolas Ronald FLORY. 16255. Jason Lloyd FLORY (Ronald Lloyd FLORY , Thelma Jean DIEFFENDERFER , Elizabeth M ZETTLEMOYER , Mary Catherine BITLER , James Lewis , James , John , Johannes ). Jason married Stephanie Ann ROBYAK. 20223 F i Katherine Mary FLORY. 20224 F ii Julia Faith FLORY. 16266. Audra M BITLER (James Bruce , Dale Leon , Roy Thomas , Adam Bruce , Adam Bruce , James , John , Johannes ). Audra married Thomas W MHIRE. 20225 M i [Male] MHIRE. 20226 F ii [Female] MHIRE. 16277. Jeremy Scott BAILEY (Kimberly Kay BAILEY , Jay Dee BAILEY , Goldie Rose BITLER , Joel Milton , Adam Bruce , James , John , Johannes ). 20227 M i Kailan K "Kai" BAILEY. Jeremy also married Sheena JOELSON. 20228 F ii Saphira Fox JOELSON. 20229 F iii Sukura Rose "Suki" JOELSON. 16279. Amanda Rose MARTIN (Kimberly Kay BAILEY , Jay Dee BAILEY , Goldie Rose BITLER , Joel Milton , Adam Bruce , James , John , Johannes ). 20230 F i Jersey "Jersey Girl". 16286. Eric Jacob HARTMAN 1 (Paul C HARTMAN , Leonard Ray HARTMAN , Harry Clayton HARTMAN , Ida Blanch SMITH , Elmira Elizabeth BITLER , James , John , Johannes ) was born on 13 Jun 1982 in Rochester, Monroe Co, NY. He died on 8 Aug 2011. Eric resided in 2011 in Richardson, TX. He served in the military with U.S. Navy - Corpsman. 20231 F i Amberlynn Ezel BUTLER-HARTMAN. 20232 F ii Rozalynn Grace BUTLER-HARTMAN. 16315. Norman L ZIMMERMAN [scrapbook] 1, 2 (Bertha G LIED , Alice L GEIGLEY , Sarah Ellen LEBO , Susanna FREES , Mary Ann BITLER , John , Daniel , Johannes ) was born on 23 May 1925 in East Earl Twp, Lancaster Co, PA. He died on 23 Oct 2010 in Lebanon VA Medical Center, Lebanon, Lebanon Co, PA. He was buried on 30 Oct 2010 in Martin's Cemetery, Red Run, Lancaster Co, PA.
Norman resided in 1930 in East Earl Twp, Lancaster Co, PA. He was issued a social security number before 1951 in PA. He worked as shop foreman (40 yrs) with Valley Protein, Inc from 1951 to 1991 in Terre Hill, Lancaster Co, PA. He resided in Apr 1997 in New Holland, Lancaster Co, PA. He resided in 2010 in Denver, Lancaster Co, PA. 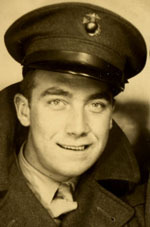 He served in the military with U.S. Marines in WW II. He was a member of Disabled American Veterans. He was a member of Trinity Evangelical Congregational Church (president of the church board, annual conference lay delegate, trustee and class leader). Norman married Ethel A ADAMS about 1945. + 20233 F i Janice J ZIMMERMAN. + 20234 F ii Josephine Mae ZIMMERMAN. Jonathan C ZIMMERMAN 1, 2 was born on 23 Jun 1946. He died on 26 Jun 1975. He was buried in Martin's Cemetery, Red Run, Lancaster Co, PA.
16317. Sara Lied LEISEY 1, 2, 3, 4, 5 (Mazie G LIED , Alice L GEIGLEY , Sarah Ellen LEBO , Susanna FREES , Mary Ann BITLER , John , Daniel , Johannes ) was born in Sep 1929 in East Cocalico Twp, Lancaster Co, PA. She died on 16 Oct 2003 in Lancaster General Hospital, Lancaster, Lancaster Co, PA. She was buried on 21 Oct 2003 in Swamp Cemetery, Reinholds, Lancaster Co, PA.
Sara resided in 1930 in Main St, Reamstown, Lancaster Co, PA. She resided in 1940 in East Cocalico Twp, Lancaster Co, PA. She graduated from East Cocalico High School in 1948. She was a member of Swamp United Church of Christ in Reinholds, PA.
Sara married Robert Eugene CROUSE on 25 Feb 1962 in Reamstown, Lancaster Co, PA.
20236 F i Paula Faye CROUSE. Paula married Dale Edward ANDERSON. Penelope CROUSE 1, 2 died in 1963. 16318. Paul Leed LEISEY 1, 2, 3, 4, 5 (Mazie G LIED , Alice L GEIGLEY , Sarah Ellen LEBO , Susanna FREES , Mary Ann BITLER , John , Daniel , Johannes ) was born on 15 Jan 1932 in Reamstown, Lancaster Co, PA. He died on 15 Feb 2007 in Reading Hospital, West Reading, Berks Co, PA. He was buried on 21 Feb 2007 in Cedar Grove Cemetery, Adamstown, Berks Co, PA.
Paul resided in 1940 in East Cocalico Twp, Lancaster Co, PA. He was issued a social security number before 1951 in PA. He resided in Oct 2003 in Adamstown, Lancaster Co, PA. He resided in Feb 2007 in Adamstown, Lancaster Co, PA. He was a member of Peace United Church of Christ in Swartzville, Lancaster Co, PA. He worked as plasterer construction worker with Rueben Zimmerman. Paul married Betty Lou YERGER on 29 Mar 1952 in Wide Hollow, Lancaster Co, PA.
20238 M i Kenneth L LEISEY. Kenneth married Katherine M TURNER "Kaye". 20239 F ii Carol Louise LEISEY. Carol married Kenneth David SWEIGART. Carol also married Larry M MALEK. 20240 F iii Robin Lynn LEISEY. Robin married Darvon A DIEM. Robin also married Michael Francis ALLEN. 20241 F iv Andrea Lucille LEISEY. Andrea married Dennis Elwood MOORE. 20242 F v Michelle L LEISEY. Michelle married Robert L GOSHERT Jr.
16319. James Leed LEISEY (Mazie G LIED , Alice L GEIGLEY , Sarah Ellen LEBO , Susanna FREES , Mary Ann BITLER , John , Daniel , Johannes ). James married Dolores R GARNER. 20243 M i Jeffrey S LEISEY. Jeffrey married Phyllis Jean REINERT. 16320. Samuel L LEISEY [scrapbook] 1, 2, 3, 4, 5, 6 (Mazie G LIED , Alice L GEIGLEY , Sarah Ellen LEBO , Susanna FREES , Mary Ann BITLER , John , Daniel , Johannes ) was born on 8 Oct 1938 in Reamstown, Lancaster Co, PA. He died on 15 Aug 2009 in Fairmount Homes, Ephrata, Lancaster Co, PA. He was buried on 19 Aug 2009 in Hahnstown United Zion Cemetery, Hahnstown, Lancaster Co, PA.
Samuel resided in 1940 in East Cocalico Twp, Lancaster Co, PA. He was issued a social security number in 1954/1956 in PA. He graduated from Cocalico High School' in 1956. He was a member of Adamstown Borough Council. He resided in Oct 2003 in Adamstown, Lancaster Co, PA. He resided in Feb 2007 in Adamstown, Lancaster Co, PA. He worked with Harting's Bakery. He worked with Groff's Snack Food. He worked with Cloister Spring Water. He worked as tax agent with Lancaster County treasurer's office. He was a member of Grace Church in Ephrata, PA.
Samuel married Maureen J FRY on 6 Sep 1958 in Ephrata, Lancaster Co, PA.
Dale L LEISEY [scrapbook] 1, 2 was born on 8 May 1959 in Ephrata, Lancaster Co, PA. He died on 2 Aug 2004 in Lancaster General Hospital, Lancaster, Lancaster Co, PA. He was buried on 7 Aug 2004 in Hahnstown United Zion Cemetery, Hahnstown, Lancaster Co, PA.
Dale was issued a social security number in 1973/1974 in PA. He graduated from Cocalico High School in 1977 in Denver, PA. He was a member of Reading Buccaneer's Drum & Bugle Corps. He worked as Cook with Zinn's Diner in Adamstown, PA.
+ 20245 M ii Daryl L LEISEY. Martha Ann LEISEY [scrapbook] 1 was born on 12 Jan 1967. She died on 15 Jan 1967. 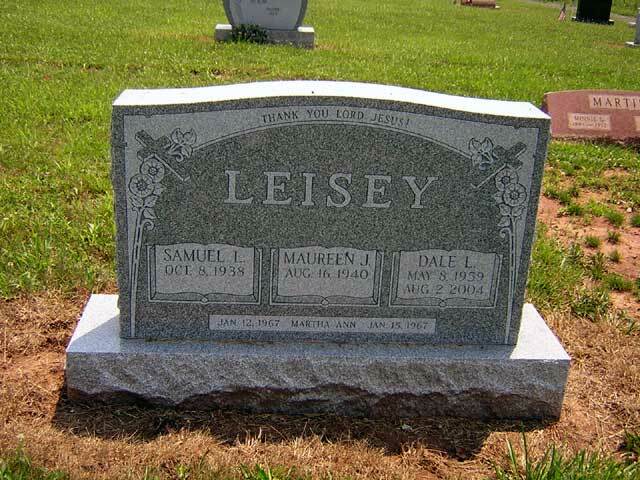 She was buried in Hahnstown United Zion Cemetery, Hahnstown, Lancaster Co, PA.
20247 F iv Deb LEISEY. + 20248 F v Diane E LEISEY. + 20249 F vi Dawn M LEISEY. 20250 F vii Donna L LEISEY. Donna married Gregory A SMART "Greg". 16322. Rev. John R LEISEY (Mazie G LIED , Alice L GEIGLEY , Sarah Ellen LEBO , Susanna FREES , Mary Ann BITLER , John , Daniel , Johannes ). John married Earla Fay KURTZ. 20251 F i Christine Renee LEISEY. Christine married Darren James LANDER. 20252 F ii Eileen LEISEY. 20253 M iii John LEISEY. 20254 M iv Christopher LEISEY.